Happy wheat Happy wheat lace zircon earrings, The new work, dazzling under the sun, is the result of hard work and continuous experimentation.... The usual fine texture is to give you the most unique jewelry... The harvest season of the earth, The bright golden wheat symbolizes prosperity and luck. Our brand was the first to lace metal lace on French ribbons, pearls and other elements. Emphasis on manual and original design Zircon will be more fully presented in the new season. 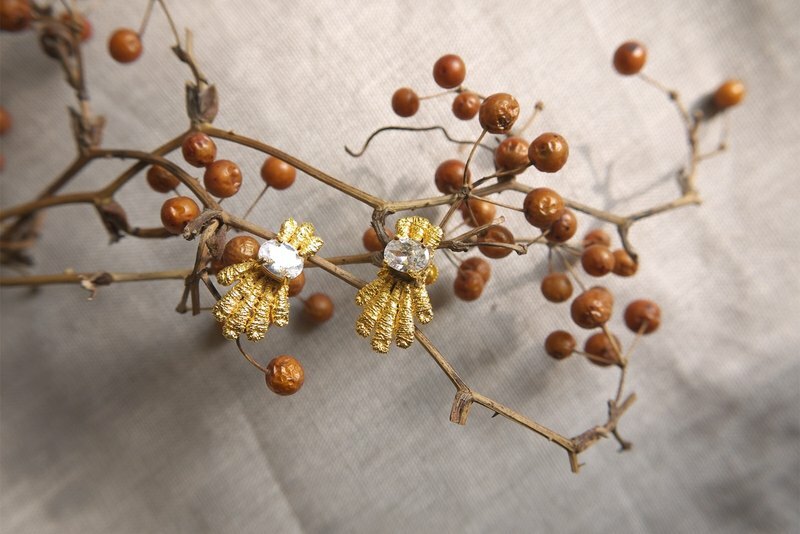 From concept drawing and design to mold making, finding and matching of various parts, It took 3 years to slowly produce This time, the earrings in wheat lace use clip-on earrings (spiral). Let beauty with no pierced ears can also easily match... In this beautiful season, bring lucky and dazzling details! / Size / About 2.2cm * 1.2cm Ear clips with the earliest burden on the ear can be adjusted spiral You can also change the ear section (stealth ear needles) ~ Please ask ~ ~ / Material / Copper jewellery gold plated Sterling silver style is customized ~ Please contact us~ / Use and maintenance / Wipe with dry cloth to avoid hot springs Each item is covered by a warranty. Some maintenance items are subject to a fee, Let fine jewelry accompany you forever.